Do you like to knit or crochet? If so, this group is for you! 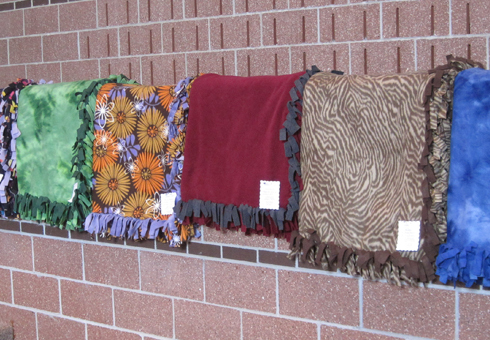 The FBC Prayer Shawl Ministry was founded in 2010 as a sub-ministry of the American Baptist Women’s Ministry. This group includes church members who enjoy knitting or crocheting and who want to use their hobby to help others in need. It even includes others who don’t know how, but who still want to provide prayer and financial support for those that do! When the group was first formed, they focused their efforts and talents on making prayer shawls. These shawls are shared with church members and friends who are experiencing times of celebration (e.g., marriage; birth of a child) or who are in the midst of a particular challenge (e.g., illness; relationship issues; loss of a loved one). They are called prayer shawls because of the emphasis placed on prayer throughout the creation of the shawl itself. The shawl makers pray for the future recipient as the shawl is begun and think about that person throughout the making of the shawl. Once complete, the group gathers together to bless the shawl before it is given to the recipient. Crafting slippers and wash cloths for women and children living in domestic violence shelters as part of the Pink Slipper Project. Making scarves for students in foster care as part of the Red Scarf Project. Creating winter hats and scarves for distribution to children at Sugar Creek Elementary School. Making blankets for FBC’s graduating high school seniors. 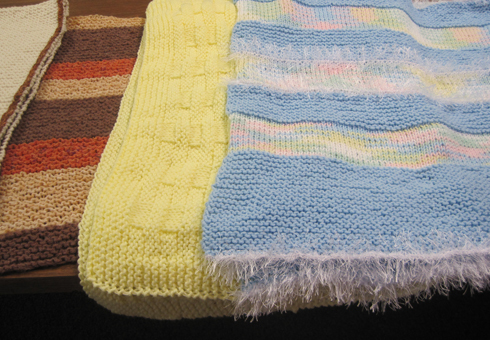 Producing warm, comforting sanctuary blankets. Whether it’s a prayer shawl for someone going through a difficult divorce, slippers that warm the hearts (and toes!) of domestic violence victims, or scarves stitched with love, this ministry exists to provide others with a tangible, constant reminder of God’s caring love for them. Contact the church office to learn how you can join this thoughtful – and expanding – ministry! To support the Prayer Shawl Ministry or any of our other mission partners, consider online giving.